A powerful account from a Columbia student, alumni at Art Basel, and the C-mojis you must download—here's your weekly news from The Low Down. This week on The Low Down, Shanna Crumley '18SIPA shared her powerful experience volunteering at a refugee camp in Greece, including the extraordinary opportunity to work face-to-face with the refugee issues that she would study, before even stepping foot on campus. Read Shanna's story. The Low Down highlighted a recent piece by CAA Arts Access, profiling College alumna Katie Enna '05CC. Enna has a lot of experience in the art world, and has been recognized for organizational growth through fundraising, operational efficiencies, strategic partnerships, and marketing. Read more. If you haven't yet taken a listen, The Low Down released Part 2 of StorySpace@Columbia, a new storytelling project by the Office of University Life that presents personal and inspiring stories from students. The podcast centers on the theme of identity and features three stories about learning. Check out Part 1 too, if you need to catch up. Happy listening! The CAA recently released Columbia-themed emojis! Do you have your C-mojis yet yet? Download the free app in the Apple Store or Google Play, and start sharing these awesome emojis and GIFs with your fellow Columbians. Polling is not an exact science, according to Columbia statistician Andrew Gelman. Read his take on the 2016 election predictions out there in the media. Research coming out of Mailman School of Public Health says that fruits and vegetables may slow ALS, also known as Lou Gehrig's Disease. Read more from this fascinating study. 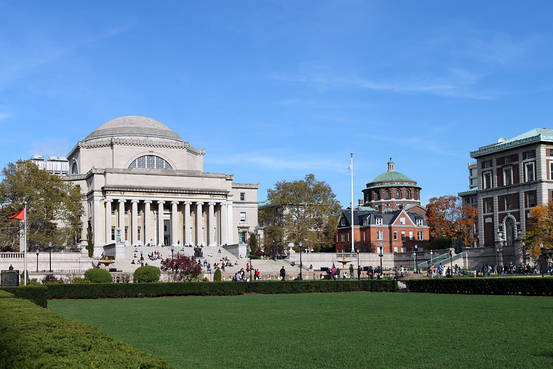 We're number one: In The Wall Street Journal/Times Higher Education's new ranking of Ivy League colleges, Columbia got the top spot.